Food Adventures of a Comfort Cook: Someone's Soup is Another's Stew. Someone's Soup is Another's Stew. Chili, is it a soup or a stew? It all depends on geographical location, for the most part, and what recipe the cook grew up on. 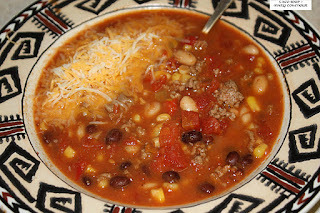 I am used to chili which is thick and hearty; that's the way I make it, that's the way my family enjoys it. However, I have been many a place where the chili is thinner and called a soup. Is the soup that different from the stew? Yes and no, sometimes it is very brothy, sometimes it is thick like a stew, but still called a soup. Confused? Welcome to the crowd and enjoy the chili. Even though I have a standard recipe that I follow, I have played with it from time to time; substituting ground beef for the sirloin steak pieces, using a different mixture of beans, different chilies. The absolute best chili so far was when I used ground New Mexico chilies instead of the regular ground chili powder which has six varieties of chilies. So this is all leading to? Taco Soup. Taco Soup? 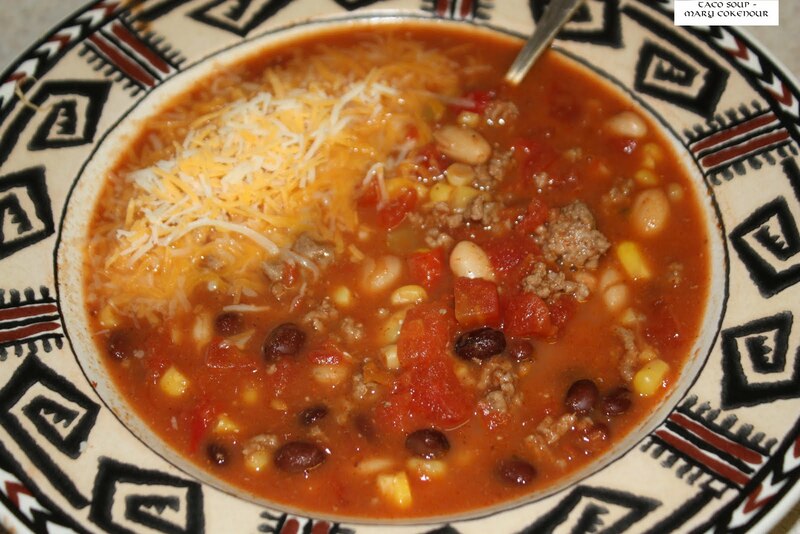 Yes, Taco Soup and yes, depending on your point of view, it can be considered chili, but it is purposely made brothy, so it is a soup. For the first time I tried taco soup; it was absolutely fantastic!! Now here's the funny part, just that day I was going through a Paula Deen cookbook and saw her recipe for taco soup. I'm not one to believe in coincidence, so I got the message clear...another recipe to play with and it was for taco soup. As I ate the soup, I consciously considered the ingredients and while I thought it was so close to chili, someone voiced the thought and there was a brief discussion on chili being a soup or not. Anyway, the next day I read the recipe in Paula's book again and then went online to see what other recipes I could find. What really amazed me most of all is how many recipe sites had taco soup listed and most of the "cooks" had Paula's recipe listed word for word; yet they listed the recipe as their own "original" recipe. So I have "cooks" in quotes to show my sarcasm as they aren't real cooks, just copycats who don't have the manners to give credit where credit is due. Back to the recipe...I didn't want to follow Paula's recipe word for word as the soup I had at the Credit Union was different than hers ingredient wise. I also didn't see the point of adding a packet of dry ranch salad dressing mix and water; I wanted the soup to taste like tacos, not ranch dressing. However, I did see it mentioned on some recipes that using dressing from the bottle could give the soup a mild, creamy texture without loading it down with heavy cream and not overpower the overall flavor. That's an idea I could go with; so while my recipe is not an exact copycat of one particular recipe, it is a mixture of ideas and wouldn't call it a completely original concept. Ok, enough droning...here's the recipe I came up with and it was perfect for the cold, windy weather that invaded our area over the weekend. Set 4 qt crock pot on low; spray with nonstick cooking spray. Put in all items from ingredients list; do not drain beans or corn. Cover and cook for 4 hours. Makes 10 (2 cup) servings.